Hamas summer camps issue inciting video of terror against Israel, calls on Palestinian girls to join the fight. Hamas’ official arm operating in all educational institutions in the Gaza Strip, Al-Kutla al-Islamiya, is encouraging Palestinian girls to register for the Islamic block’s summer camps. 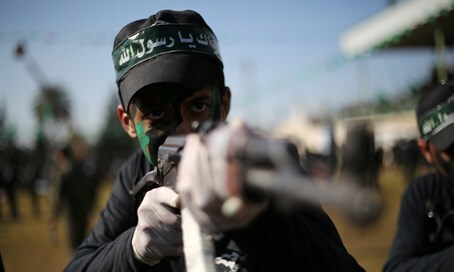 Hamas promises that the camps will enrich their knowledge, strengthen their fear of Allah and moral values in religious preaching (Da’wah), as well as hiking, crafts, entertainment, lectures and more. The video produced was called: “Join Us”, showing images of two young Arabs girls armed with Kalashnikov assault rifles with the Al-Aqsa Mosque in the background. The accompanying track record sings of the goal to liberate the Al-Aqsa Mosque. ​Summer camps are repeatedly used as a tool to strengthen the Hamas religious indoctrinate among the younger generation, many which include military training – a strategy which Hamas calls ‘building the Jihadist generation that will liberate Palestine’.